There’s a successful cafe in Port Melbourne called Third Wave Cafe, and they’ve opened up a second location in Prahran. I’ve not been to North Melbourne’s incarnation, but if it’s anything like the Prahran one, it’s probably pretty decent. I ordered their baked eggs, because I hate the roof of my mouth. In all seriousness, I do not have the patience for baked eggs, and should never allow myself to order it… but if I was going to break that rule, Third Wave was the place to do it. 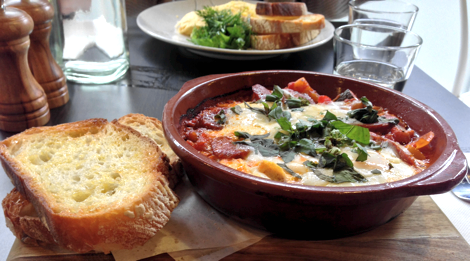 Specifically, they offer Spicy Ratatouille Baked Eggs, and as I had a vegetable craving, I was compelled to choose it. It didn’t disappoint: the vegetables are primarily very juicy peppers and eggplant, complemented with a decently spicy sauce. The sauce is strongly-flavoured, which I loved, but if you’re someone who doesn’t enjoy an intense curry flavour, your mileage may vary. My friend grabbed the special omelette, mostly on the strength of the promised hot smoked salmon within. You see a lot of cold smoked salmon around the place, so when a hot salmon turns up, you’ve got to go for it. The omelette was I believe an egg white omelette, and almost disconcertingly well-formed. I’ve been burned by some desperately attractive omelettes in the past that have been somewhat bland, but here the egg, hot salmon and cheese worked together beautifully. By itself, you might have accused the meal of being overly rich. But this was avoided by a delicious herb-salad arrangement with fresh mint, chives and dill. 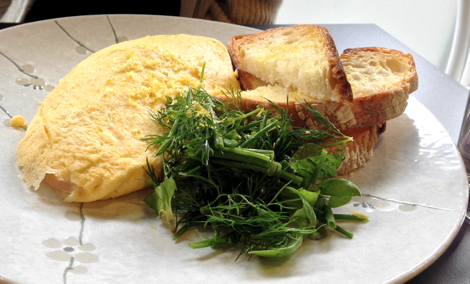 Maybe I’m not well-travelled enough to have had omelettes with salads before, but I like it. Add a bit of crisp and tasty herbs to a mouthful of delicious omelette, and suddenly it feels a lot more like a meal and less like an indulgence. It's worth mentioning that the Prahran branch of Third Wave is into the Paleolithic era in a big way. While they don’t worship half-human, half-animal creatures… that I know of… they do provide a full Paleo menu. You can check out the thinking behind the Paleolithic diet if you like, as well as some of the controversies… but regardless of how accurate the term is, those of you with gluten or dairy sensitivities will appreciate it. I feel like I should talk about the coffee, but it’s hard to say much as I only really have three levels for coffee: excellent, inoffensive, and oh my god someone has given me a soy latté by accident. So, er: the coffee was excellent. I’d recommend Third Wave: our meals were delicious, and a little different to the usual fare. And if you get there while they’re new, you can snag yourself a fantastic breakfast without the hassle of fighting for a table.